Welcome to The Retreat, a full service New Orleans hair salon and a premier destination for all things beautiful. We offer a sensational palette of luxurious experiences for mind and body! Far from being one of New Orleans’ cookie-cutter salons, you’ll discover a warm inviting atmosphere and a personal experience with a staff that is entirely devoted to your happiness. Individual attention, a non-rushed visit, professional tips and advice, and services that are customized according to your preferences are all part of every appointment at The Retreat! You may never want to leave. Awaken and rejuvenate your spirit by spending an hour or a day! Hair Salon Services: Haircuts, hair color, hair extensions, keratin treatments and beyond from a team of master stylists who are at the top of their field. A personal consultation is included with every appointment to ensure your complete satisfaction. Facials and Professional Skin Care: Our facials are customized for specific skin care needs --anti-aging, deep hydration, cleansing, and nourishment for your skin. Swedish, Deep Tissue or Prenatal Massage: The perfect therapy for the stressed and weary. Waxing: From head to toe, we have you covered. Our Brazilian wax is the best in New Orleans! Spray Tanning: Our Fake Bake airbrush spray tans give you a natural looking bronze tan that looks like you just got back from the beach! Makeup and Lashes: The finishing touches, the little extras that bring your look together. Enjoy luxurious eyelash extensions and a custom makeup foundation created just for you. Nail Salon Services: Our mani and pedi services are extra special and long-lasting. For the ultimate treat, try a Gel polish manicure or pedicure—no chipping or peeling, just gorgeous shine and a mirror-like finish that will last for up to 2 weeks. We are honored to have been chosen to create the hair and makeup for Anne Rice's Vampire Ball. Visit us soon and discover why we are among the best hair salons in New Orleans. We look forward to meeting you and making your day extraordinary! Is your hair unruly, frizzy, or out of control? 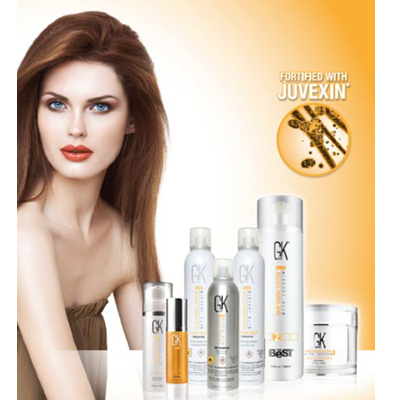 Our amazing GK Hair Taming System is the best keratin treatment in New Orleans. You can kiss your hair woes goodbye after receiving this amazing treatment which will leave your hair soft, silky and unbelievably smooth for months! Our GK Hair treatments contain no artifical ingredients and no harsh chemicals. 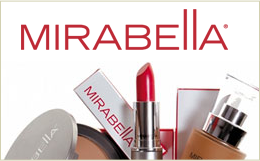 Mirabella is an award winning premium line of mineral based cosmetics that are formulated for every skin type! Every Mirabella product is infused with superior ingredients that are paraben free and safe for sensitive skin. Choose from high performance foundations, lipsticks and glosses, eyeshadows and blushes, and more! 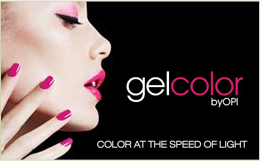 OPI Gel Color is the answer for anyone looking for the perfect manicure or pedicure. It dries lightning fast with a mirror finish and will last for 2 weeks without chipping and peeling. No kidding. Our salon promises you'll be completely amazed. Our hair salon is honored to offer an intensely rich collection of luxury hair care products that are sulfate free. Shuga products help to restore moisture levels, repair damaged hair, and nourish healthy hair growth. If your hair is begging for a little TLC,pamper your tresses with this amazing line of hair care!